Git's command interface is generally considered somewhat confusing and inconsistent. Luckily, beneath the command interface is a wonderfully consistent and straightforward object model. By gaining an understanding of the object model, we can easily wrap our heads around even the most complex Git operation by thinking in terms of these objects. In this video, we'll lay the foundation of the Git object model, describing exactly how Git stores and references our code. To help illustrate the points of our discussion, we'll create a file with the classic hello world as the contents. and Git kindly creates the repository for us. HEAD A "pointer" to the currently checked out object (more on this later). objects/ Where Git stores its representation of all files, directories, and commits. refs/ Where Git stores all branches, tags, remotes, etc. config, description, hooks/, and info/ contain metadata, and we can ignore them during this discussion. First, we'll be focusing on the objects/ directory. It's best to think about this directory as a mini file-based database where Git will store its representation of our files, directories, and commits. If we take a peek at the objects/ directory, we'll see that it remains empty. Git does not run on its own in the background. If we run git status, we see that Git is aware there is a new file, but has not started tracking it. Thus, the file is not in the .git/objects directory yet. Now we'll take another look, and see that we have our first Git object! Here we can see a new directory and file. Every object in Git has a unique 40-character hex string as its name, and Git uses this name to store the file (this technique is called content-addressable storage). Git takes the first 2 characters of the object's name and uses them as the directory, with the remaining 38 as the file name. We'll ignore this subtlety going forward, as it is a performance optimization, but it is good to know for later on. Again, we see here that Git is only storing the contents of the file, namely hello world. Other information like the mode, permissions, and file name is stored elsewhere. Because Git only stores the contents of the file rather than the name or any metadata, it can tell when you are giving a different name to the same version of a file and therefore process it quickly. If we have two files with identical content but different names, the content has only been stored once! When storing our file, Git uses a "blob" which only concerns itself with the contents of the file, ignoring our filename (for now). However, it does need a name, and we've seen that Git uses a seemingly random 40-character hex string as the name. It turns out this string is in fact not random at all, but is produced by taking the content that Git stores and running it through a "hash function," the SHA-1 hash function in this case. The hash function takes a string of any size as an input, and returns a 40-character hex string as the output. Determinism - The same input will always result in the same output. Defined range - All outputs are 40 char hex. Uniformity - Outputs are evenly distributed over the possible space, and a small change in input yields a huge change in output. The use of these hash values as the names for our objects makes operations like deep comparison of files and directories easy, as we're only comparing the hash values. Going forward, we'll refer to these names as a "hash." We're close to fully understanding how Git stores our file, but if we try to replicate the hash function on the content "hello world," it doesn't match with the 3b18e512... hash. Now we have a complete understanding of how Git names and stores our blob objects. Git uses a similar metadata structure for the other object types, but from here on we'll only discuss the primary content of the Git objects, ignoring the metadata. It wouldn't be very useful if we could only track the contents of files, and not even the file names or the structure. This is where "tree" objects come in. 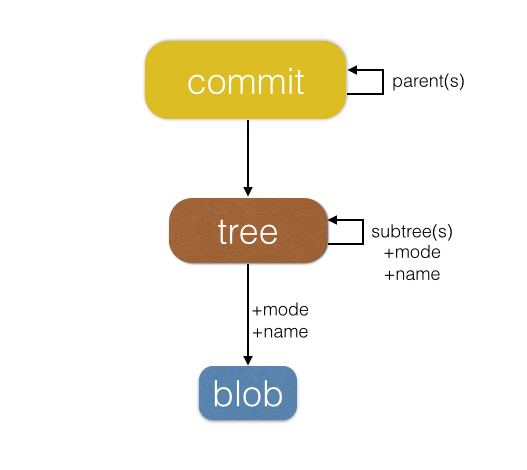 A "tree" in Git is an object (a file, really) which contains a list of pointers to blobs or other trees. Each line in the tree object's file contains a pointer (the object's hash) to one such object (tree or blob), while also providing the mode, object type, and a name for the file or directory. Our new tree object consists of a single line, listing the mode/permissions, the type, the hash, and the file name of our readme.md file. Again, we'll note that tree objects themselves do not have names, much like blobs. Parent trees associate names for subtrees, and the root tree, referred to as the "working tree" of a repository, in fact has no name. The repo doesn't care what you call it. You can rename your local directory that contains your repository to anything you'd like. Git is blissfully unaware of the name of the directory that contains the .git repo directory. We can rename subtrees as much as we want, and only parent objects need to update. The subtree object itself and everything below remain untouched. Looking in the objects/ directory, there are now multiple new objects. Of most interest to us is the new tree object for our working directory, our current root tree. Since there are so many objects now, we can't just guess which is which, but we can ask Git directly to show us a specific tree using the ls-tree command. We passed master as the "tree" to view since master, a branch, points at a commit, which points at a tree. By passing master as the argument, we're identifying the tree master indirectly points at. Trees list out the contents of a directory (blobs and subtrees). For each object, the mode, permissions, type, hash, and name is listed. Tree objects must contain at least one blob or tree. Trees can be nested to any depth. Trees, like blobs, don't store names. The names are stored in parent trees. Trees are named and stored in the objects/ directory by hashing their contents (the list of objects described above). A commit is the final piece in our object puzzle, and it connects all of the other objects together, acting as the hub of our object graph. Just like with our other objects, we can use cat-file -p to get a pretty printed view of how Git stores commit objects. The hash of the working tree - This is always a single tree, never more, never less. The tree can point to any number of subtrees, but for every version of our code there is one root working tree. The hash of the parent commit(s) - Git tracks the history by simply pointing at the previous commit. In the case of a merge, there can be multiple parent commits, or, in the case of the root commit, no parents. The author info and date. The commiter info and date. This file is then passed through the SHA-1 hash function and saved alongside our other objects in the .git/objects directory. It's worth noting that the commit object only contains a single reference to a working directory; Git doesn't store diffs. When diffing between two commits, it compares the working trees of the commits, computing the diff on demand. Blobs - Contain the contents of a file. Trees - List the contents of a directory, connecting "blobs" with names and permissions to reference files and subdirectories. Commits - Store a reference to a specific version of the code (a single tree), the direct parentage (parent commit hash(es)), and other metadata. We've also seen how we can walk through the history by following the hash references from commits, trees, and eventually to blobs. This wraps up the foundation of the object model, but in the next video we'll see how branches, remotes, and tags fit in, as well as how Git commands operate on these objects.